Automatically activates when you are near by utilizing your smartphone's location. This assures maximum comfort for your arrival. Geofencing automatically regulates temperature when you're away. IAQ Compatibility- Humidifier, Dehumidifier or Vent. This thermostat includes a 3" diameter polished glass face and a 1" beveled depth. 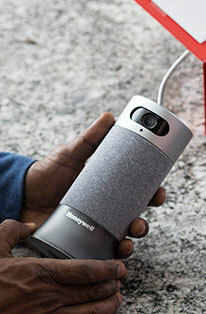 The Honeywell Lyric C1 Indoor Wi-Fi Lyric Round Wi-Fi Thermostat was designed to fit into your crazy schedule. The Lyric can be controlled from anywhere on your smartphone, or it can adapt automatically to you. This Wi-Fi thermostat can save you energy while you're away, and get the house warm when you're heading home. No more wasted energy when you're out for the night, and no more getting in from work to a cold house. 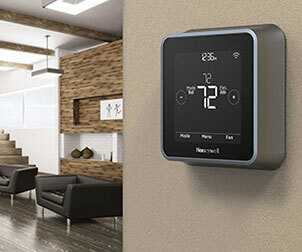 The Lyric Round Wi-Fi Thermostat will notify you when your filter needs to be changed. You'll be able to view a 6 and 12 hour forecast, so you can plan your day. 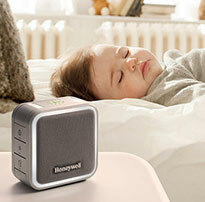 The Honeywell Lyric Round Wi-Fi Thermostat considers both humidity and temperature to maintain your comfort. View and adjust the humidity levels in your home. This one of a kind thermostat keeps your home running efficiently, ultimately saving you money on energy. 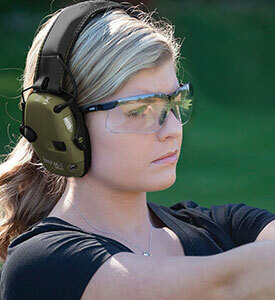 Honeywell invents and manufactures technologies to address some of the world's toughest challenges initiated by revolutionary macrotrends in science, technology and society. We create solutions to improve the quality of life of people around the globe: generating clean, healthy energy - and using it more efficiently. Increasing our safety and security, Honeywell enables people around the world to connect, communicate and collaborate. Product Dimensions (WxDxH): 3.78 x .79 x 3.78 in. Wifi Compatible: Minimum requirements = a compatible 802.11b/g/n wireless router and a smartphone or tablet with Android 2.3 and above or iOS 6 and above is required. I have Samsung Smarttings Hub at my house and I have tried purchasing 2 other round wi-fi thermostat and both did not integrate with Samsung smartthings hub. If you want this unit to integrate with ST then make sure you have to purchase this model RCH9310WF. Installation went smoothly and it is working fine. I love it. I recommend it. Q: Will the Lyric thermostat work with my HVAC system? A: The Lyric thermostat is designed to work on most low voltage heating and cooling systems, at 24 Volts. Gas and oil furnaces, heat pumps, and hot water systems are examples of these low voltage systems. The thermostat can also support multi stage systems with more than one stage of heating and cooling. The Lyric thermostat does not work for 110V or higher line voltage systems, such as electric baseboard heaters. Thick black, red or white wires connected with wire nuts running to your existing thermostat will typically mean you have a high voltage system. Q: How do I get started with setting up my Lyric Thermostat? Search "Lyric Thermostat" in the Apple App Store or the Google Play store to download or update the free app to your smartphone or tablet. Setup is a cinch with the guided walk through.